Perhaps, one of the most popular and sold out gowns to grace the Valentino runway of the 2003 Valentino Runway collection. Fashioned of jet black silk velvet with its surprise adornment of large jet beads speaks volumes of Valentino's endless ability to create incredibly impressive creations. Designed with luxurious deco artistry, makes this a timeless classic. Cut on the bias in a slightly "A" line style showcases a simple, slenderizing silhouette. 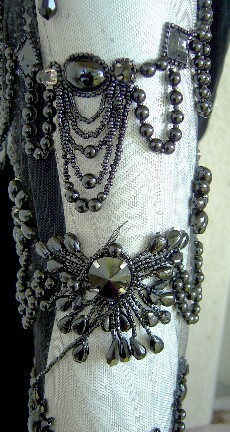 With peek-a-boo shoulder sleeves, and plunging back of net adorned with large jet beads recreating an art deco feel. Fully lined.